Vector Speech & Debate is a Christ-centered organization of homeschooling parents and students in Northern Virginia with the goal of providing opportunities to develop communication, leadership and critical thinking skills. Through a variety of speech and debate competitive categories, students are trained to articulate their Christian worldview clearly, persuasively, and charitably while examining the underlying mindsets and assumptions expressed in today’s secular culture. Vector hosts multiple tournaments in the NoVA area during the winter and spring. 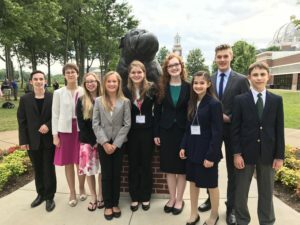 Stoa is a national High School and Junior High Speech and Debate organization serving the needs of privately educated, Christian Homeschooling families. Stoa trains and supports leaders who in turn develop students into confident, articulate leaders who can change their culture through the marketplace of ideas. Our students become like family, learning to encourage one another, accept criticism, and accept both victory and defeat with grace. Our graduates have become leaders at every level of work, community, and ministry.